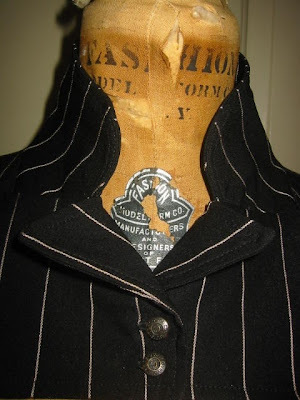 After having some time to catch up on badly needed sleep (mother of 2 young-uns), I have re-visited my calling to improving old or ugly, worn or dated or just plain boring clothes with a focus on Neo-Victorian or Steampunk aesthetic. I have always been an historical clothing fan and now have the chance to put my own spin on that era's clothing. I love that there are lots of folks out there who are keeping the regal and proper attire alive from the Victorian age by dressing up and carrying out Live Action Role Play (LARP) and going to conventions and having parties where the people are polite, the guns are extremely creative DIY and the clothes are amazing! 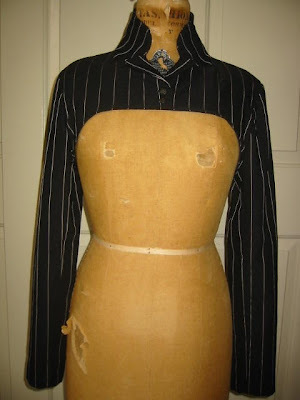 I'll be sharing some projects I've done and some that are still in my head (everything comes out organically on the dress form--I almost never sketch ideas for clothing). 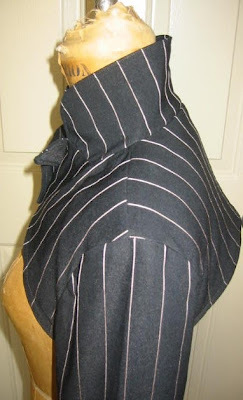 This black pinstripe shrug is from a basic contemporary jacket I picked up at a thrift store. I chose to leave the back unfitted as I liked the way it stood out, giving it a sculptural feel.